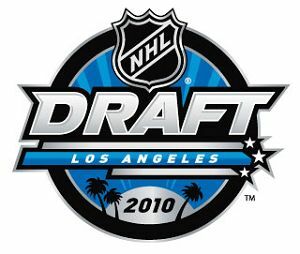 With the 2010 NHL draft quickly approaching (tomorrow), there are few sure things and a whole lot of question marks. Here's what we know. Both the Oilers and the Bruins will be receiving very special players tomorrow afternoon in Hall and Seguin. The order is not known, but most experts are predicting Hall to go first. We also know the Pens will need to make this first rounder count due to the fact they do not have a 2nd round pick. (traded away this season for Jordan Leopold). Beyond that it is a very wide open draft. It is very likely that the Panthers and Blue Jackets each take one of the top rated defensemen with the next two picks. There is the gritty and tough Erik Grudbranson and the smaller but more agile Cam Fowler. Again, the order is unknown as is pretty much everything afterwards. Now, rather than spend hours and hours toiling over each team's individual needs and spend hours writing it all up, I will focus in on the one question you all want answered. "Who will the Pens draft?" Picking right in the middle of the first round (20), you can ask this question to 10 people and get as many different answers. Ray Shero has made it unclear as to whether he is looking for a future investment in forward, or a young blueliner to join the corps he has already been building for a few years, so I will name a few of both. Personally, I would prefer a forward, but a strong case can be made either way. Here are a few players the Pens may like to take, but possibly will not be available. Austin Watson- (RW, Peterbourough) Though the Ponikarovsky experiment was a failure, Shero has been looking for a large winger for a few years. The big forward of the future is currently considered to be Eric Tangradi, but it never hurts to have a backup plan. Jeff Skinner- (C, Kitchener) Yes, I know he is a center, but if Bylsma continues to fancy Geno as a winger, than perhaps he could be a potential second liner (assuming Staal stays on checking line). He is a great shooter, and doesn't seem far off of development. I wouldn't get too worked up about it, as he will probably be gone anyways. These guys are more likely to be around when pick #20 rolls around tomorrow afternoon. Quinton Howden- (LW, MooseJaw) Howden has a little way to go in his development process, but Shero can do a very nice job of keeping the farm stocked by picking Howden. Howden possesses a well balanced array of offensive skill. I wouldn't mind seeing Shero take him one bit. Dylan McIlrath- (D, MooseJaw) This 215 lb bulldozer provides exactly what the Pens need on their blue line. Aside from Brooks Orpik, the Pens current defense consists of smaller, agile and technical d-men (Letang, Goligoski, Eaton, Lovejoy, Gonchar). Yes, some of them are scrappy but don't provide the presence that a man like Orpik does. One Orpik is a huge presence, 2 makes it an intimidating force. Some dark horse picks that will probably be there at #20 if Shero wants to take a chance. John McFarland- (LW, Sudbury) Picked #1 in the 2008 OHL draft (above Seguin, etc), the potential is clearly there for McFarland. He is oozing with raw talent, though his development has hit a few rough patches. If the Pens are willing to put in the time to turn him back on the right track, this can be a risk/reward move that pays huge dividends. Tyler Toffoli- (RW, Ottawa67s) Another "long term" type of player, Toffoli reminds me of a Sykora type shooter. Since the departure of Sykora and Satan, the Pens have been without pure goal scorers not named Sid or Geno. Toffoli can solve this problem, though it will take some time. The first round can be seen tomorrow on versus, starting at 7 ET. I hope they get Vladimir Tarasenko. I think he falls to them too.